Most portable electronic devices are powered by a variety of rechargeable batteries. The main advantage of such batteries is that they can be used many times due to the possibility of recharging. This time, let’s talk about a gadget such as a new battery charger. 3. Number of charging channels. What is a battery charger? A charger is a device for charging battery cells from the power of various external sources. There are different types of battery chargers differ in the specifics of the items that can be charged with their use. For example, to charge cell (mobile) phone accumulator, there are special chargers that connect directly to your phone. In contrast to them, compact AA battery chargers or other formats require the installation of these batteries in the device itself. Many people charging even a car battery with a battery charger lately. Let’s concentrate today on the second type of chargers. Li-ion and other types of batteries are currently used in consumer electronics. However, many not very new devices, such as cameras or MP3 players, as well as toys, still use the so-called fingers (AA) batteries. Such batteries can be single-use or rechargeable. External chargers are used for charging these batteries most commonly. First of all, you need to determine which type of battery is used in your technique. The most commonly used batteries are AA batteries (standard fingers), AAA (mini fingers) or Crown batteries. Charging devices almost always support charging of AA and AAA elements. The support of other types of batteries needs to be recognized on a case-by-case basis. Depending on the type of charging items, you can select types of chargers, including standard (for a certain type of batteries) and combined (for different types of batteries). The charging power of the charger affects the time the battery is fully charged. If it is bigger – the batteries are charging faster and vice versa. There are also special “quick charge” chargers. In such devices, the current strength is greater, resulting batteries can be charged even for a quarter of an hour, whereas for standard charging it may take from 3-4 to 8-12 or more hours. If you need quickly batteries charging – choose “fast” chargers, in all other cases – it’s better to buy standard ones – this will extend the life of your batteries. Some chargers have a current regulator (adjustable charger) that allows you to adjust the charging time. 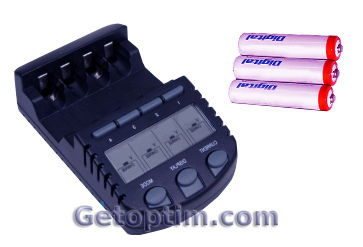 The number of channels depends on the number and type of batteries that you can charge simultaneously, with different channels you can have different characteristics of the current. The more channels number is better. Protection against overheating and incorrect polarity. If the nutrient element overheats, overcharges or you just install it incorrectly (not side by side), this protection will help prevent damage to it. Ability to work from low voltage sources. Basically, batteries charger operates from a 220V power supply, but they can have special adapters that allow the operation of the 12V network, which greatly extends the ability to use the device without access to the main network. Discharge function. Rechargeable batteries, except Li-ion batteries, are not recommended to be charged until they are fully discharged. This feature will help you completely discharge your batteries before recharging, which will significantly increase their lifetime. On some devices, along with this feature, there is a “workout” function, which, through a series of charge-discharging, helps restore the functionality of the battery. The presence of the display. Now in many chargers there is a display, which shows the main indicators of the charging process (current, voltage, time), which is very convenient. Often, this option has so-called “smart” chargers. The most famous manufacturers of chargers are Sony, Varta, UFO and others. Hope this information will help you to buy a good charger for your batteries. I want to add some information – a battery charger for tablets or smartphones must have 2 amperes of strength.